Ultimate technical purpose is to cultivate enough ability to defend and attack with any kinds of weapons against all kinds of attacks as a result of enough knowledge and long years training through the study of the traditional weapon katas. 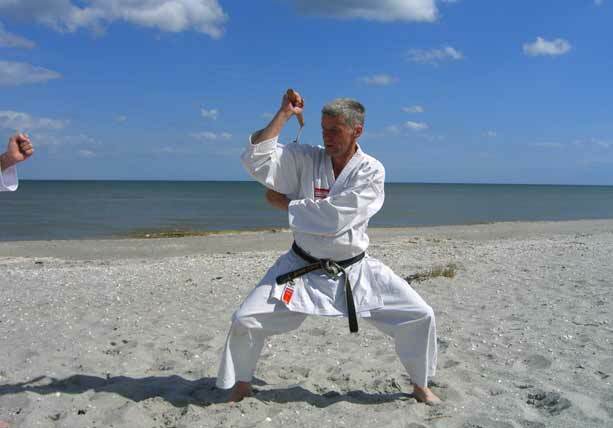 For its realization and the sure preservation and promotion of Gansho Inoue sensei´s technical achievements, we regulate the phased weapon coaching system which consists of 42 traditional kata and the basic technique in each weapon such as the way of using, basic kumite and explanation kumite etc., bearing the technical elements of Toshu jutsu ( Martial arts without weapons ) in mind. 2. We always keep in our mind the importance of mental training as Human education and try to provide the students with good balance of both technical and mental aspects. 3. Der er 4 forskellige variationer af Bo, San Shaku, Kyu Shaku, og Eiku(eller Sunakake Kon) Bo er det våben, der er størst opmærksomhed og det bedst dokumenterede våben med 22 Bo-kata. Roku Shaku Bo er den mest brugte variant af Bo. Længden er ca 180 cm. Mindre almindelig er Jo Bo, ca 130 cm lang, Kyu Shaku Bo er 250 cm lang. Eiku er en åre / pagaj. RKHSK benytter 8 Sai Kata, 2 Tonfa Kata, 3 Nunchaku Kata, 3 Kama Kata, 1 Tekko Kata,1 Tinbe-Rochin Kata og 2 Surujin Kata ( Tan Surujin - Kort 150 cm) og (Naga Surujin - lang 240 cm).